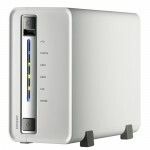 Browsing through the Seagate and QNAP forums, I found a working solution. The trick is to disable the Advanced Power Management (aka APM) feature of the Seagate HDD which will also reduce the Load_Cycle_Count. Before continuing please read the disclaimer below. Making modifications to the QNAP NAS and/or HDD can cause hardware failures/defects if not handled properly. I am not responsible for any damages that occur due to these modifications. To be short, these steps are written in the hope that they will be useful, but WITHOUT ANY WARRANTY; without even the implied warranty of MERCHANTABILITY or FITNESS FOR A PARTICULAR PURPOSE. 1. Login to the web administration panel of the QNAP NAS. 2. Click on ‘Applications’ -> ‘QPKG Center’ in the sidebar. 3. Install and activate ‘Optware’. 5. Login with your administrator account to the QNAP NAS using PuTTY/SSH. 7. The latest version of hdparm will be downloaded and installed. 12. After completing these steps successfully, the annoying “chirp” sound should be gone.